Both coursesThe course will take place in a classroom with no more than 30 students in order to maintain a good level of interactivity. Students may ask about their specific issues at dedicated times during the courses. Each attendee must bring his/her laptop for exercises (Hands-on Lab). We will provide the configuration required. You benefit from a 3-year (36 months) access to the recorded version of the classroom courses on both mobile and desktop browsers. The video courses are valid study companions is a valid study companion to review the concepts learned in the classroom, and they are to be used as a reference. Note that you can watch the video courses before class, as a good exercise to familiarize yourself with the main training. After you submit your registration, the course isthe courses are only considered confirmed once you have received a specific confirmation email. If the course isthe courses are not confirmed, you should not schedule non-refundable flights and hotels. Marco was our trainer for 125 other courses at SQLBI. Marco is a business intelligence consultant and mentor. He first started working on Analysis Services in 1998, back when Analysis Services was known as OLAP Services. A veteran of end-to-end projects, Marco wrote several books with Alberto Ferrari about Power BI, Analysis Service, and Power Pivot. They also regularly write articles and white papers that are available on sqlbi.com. Marco is a Microsoft MVP and an SSAS Maestro, the highest level of certification on Microsoft Analysis Services. Today, Marco focuses his time with SQLBI customers, traveling extensively to train and consult on DAX and data modeling for Power BI and Analysis Services. Marco also teaches public classes worldwide. 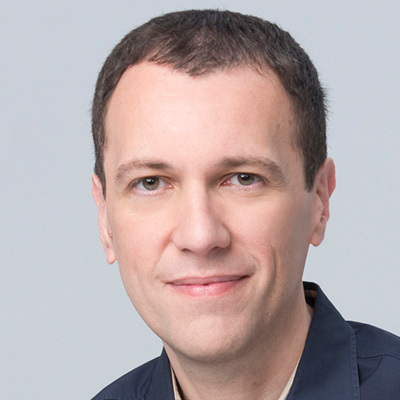 Marco is a regular speaker at international conferences like Microsoft Ignite, PASS Summit, and Sqlbits. He also enjoys delivering evening sessions at local user groups during his trips. When he is not working, you can find Marco fine tuning his expertise of Neapolitan pizza or test driving electric cars. 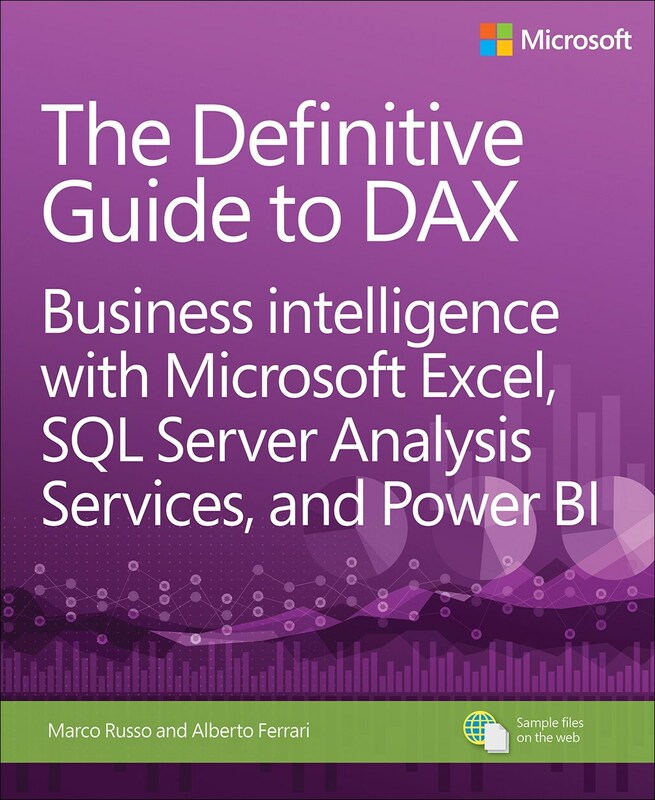 Each attendee will receive a copy of the book, The Definitive Guide to DAX (Paperback or Kindle - written by Marco Russo & Alberto Ferrari - published by Microsoft Press) to use as study companion. Coffee breaks and a light lunch are included for all days. Please communicate any dietary requirements in the Order Notes field during checkout. 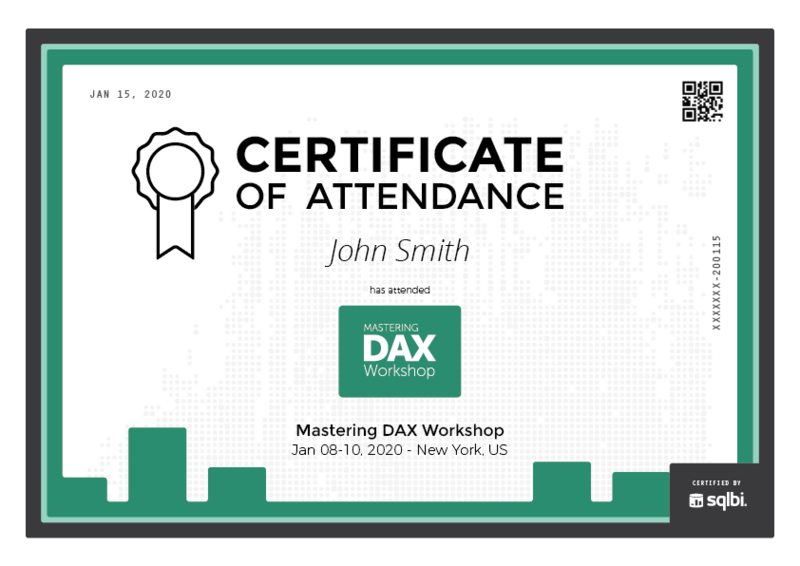 At the end of the courses, each attendee will receive a certificate of attendance via email in PDF format. Along with the file, every student will get a special page on our website that can be shared on social networks. Save 72% on the recorded versions of the classroom courses. EachThe video course contains most of the content of its classroom equivalent, making it a good study companion. You can get a group discount by registering more than two attendees. To obtain the discount, just press the Register now button and select the number of attendees in the next step.